Did you know that February 14th has significance beyond jewelry, chocolate, roses, and romance? 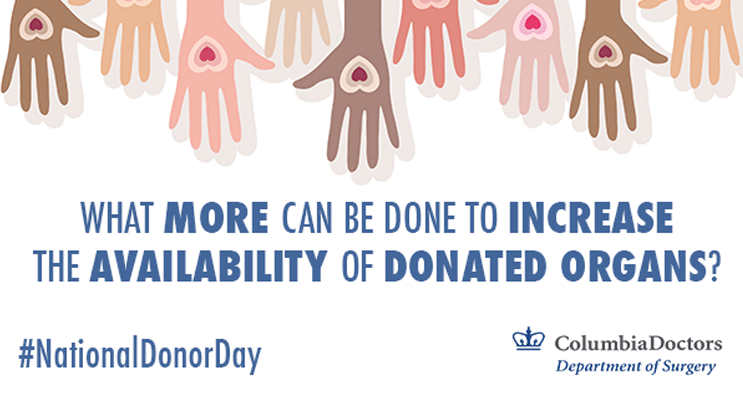 This day is also celebrated as National Organ Donor Day by those whose lives have been touched by organ transplantation. While most of us would like to believe we would receive a life-saving transplant if it were needed, the unfortunate reality is that most patients in need of a heart, lung, kidney, liver, or pancreas are not among that lucky minority. Overall, the number of patients waiting for a transplant far exceeds the number of available organs. Nine out of ten adults waiting for a new heart each year will not receive one. While increasing the number of people who register to donate their organs is certainly a critical way to boost access to organ transplantation, it's not the only way to solve this problem. One factor contributing to this shortage is that in the U.S., many donated organs go unused because they are considered imperfect due to the organ's condition or the donor's health status. Yet evidence is now clear based on numerous studies that many discarded organs are in fact viable — and that recipients have excellent outcomes with them — when they are properly assessed and reconditioned using techniques to cleanse them and infuse them with oxygen and nutrients. This approach (as in ex vivo lung transplantation or hypothermic machine preservation of livers) is steadily increasing the number of organs available for transplant, thanks to research protocols led by Drs. Frank D'Ovidio, James Guarrera, and others at NewYork-Presbyterian/Columbia. Surgeons in the heart transplant program have been using 'extended criteria' hearts (hearts that may not meet the traditional criteria for donor organs, but are nevertheless healthy enough for transplantation) with great success. As Dr. Yoshifumi Naka, Director of Cardiac Transplantation and the Mechanical Circulatory Support Program, notes, the use of extended criteria hearts enables some patients to undergo transplantation sooner, and earlier transplantation results in better long-term outcomes than if patients had waited longer for a 'perfect' donor heart. Today, Dr. Lloyd Ratner and colleagues are aggressively evaluating and using 'extended criteria' pancreata, allowing more patients to receive pancreas or kidney-pancreas transplants, also with excellent results. Protocols to use extended criteria organs represent just one of many approaches that are helping to expand access to the life-saving gift of transplant surgery. Learn more about organ donation and transplantation here.